Wonder Spouse and I have lived on our five acres of green chaos since 1989. We’re not in a subdivision. Our road was a country road to nowhere back then, with mostly small houses set back from the street a bit, adjacent to fields and forest. Subdivisions seem to multiply daily around us now; schools were built, water lines were laid, but our five acres remain — for now, at least — fairly secluded, thanks to the large creek that forms our eastern border. The land on the other side has been logged in the past, but likely because of its swampy nature, no one has tried to put houses on it. 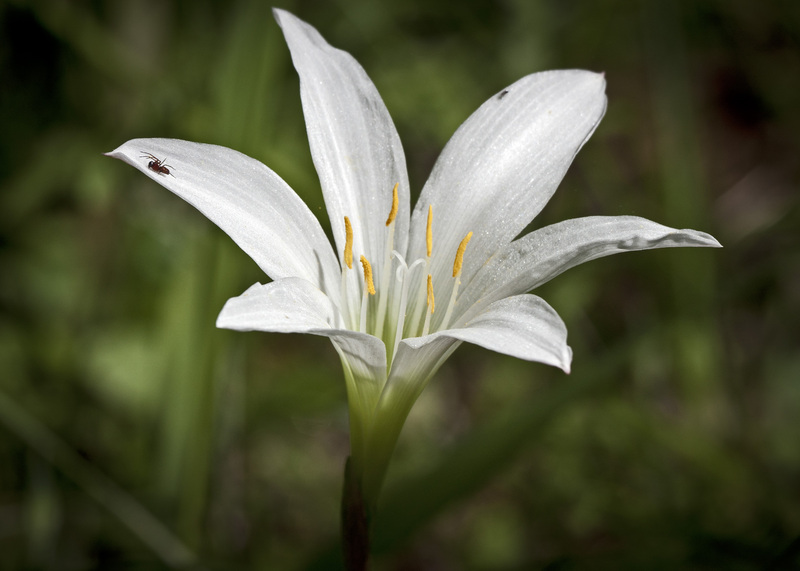 Atamasco lily with an admirer (click on the photo to see a larger version). We found our place in January, but I knew enough about piedmont forests and ecosystems to recognize that the snow-dusted landscape was special. Part of our land is an active floodplain; some years, the creek overflows across it up to a dozen times, turning our home into lake-front property for 12, sometimes 24 hours. 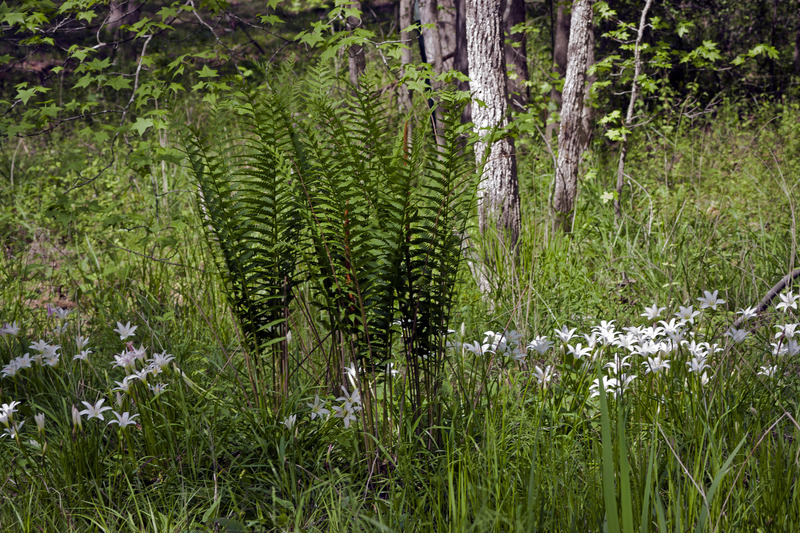 One edge of our land shelters a remarkably healthy wetland, where Atamaso lilies, Jack-in-the-pulpits, Lizard’s Tails, Cinnamon ferns, Sweetbay magnolias, and other southeastern US wetland natives thrive. Close view of a purple-striped Jack-in-the-pulpit flower. As they fade, Atamasco lilies grow more pink. They were here when we moved in, and I’m delighted to report they are still here, and still thriving. The wetland plants are having a spectacular spring this year, likely due in part to a mild winter, and I think the beavers that have claimed the land on the other side of the creek have much to do with the improved vibrancy of the wetland communities. 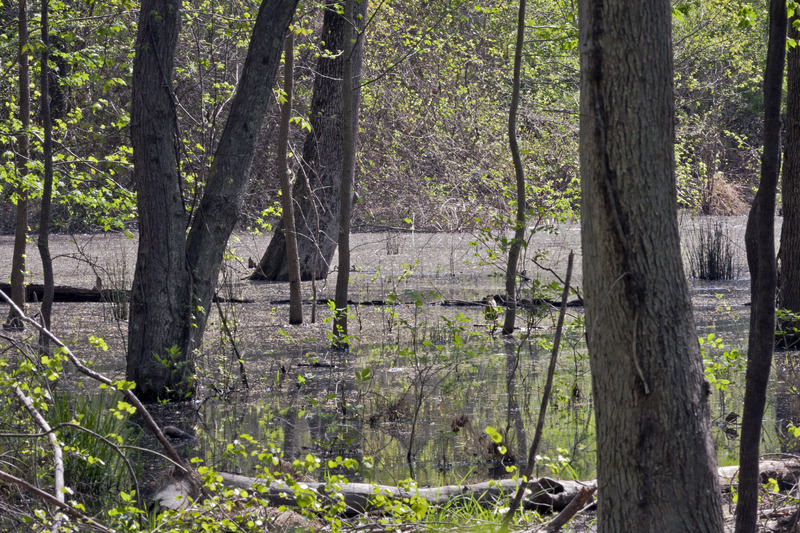 The beaver pond continues to expand in width and length, engulfing canopy trees. My area is in a moderate drought, which usually means our creek drops to a trickle. Not this year. This year, the creek is deep, sluggish, and brimming with wildlife. 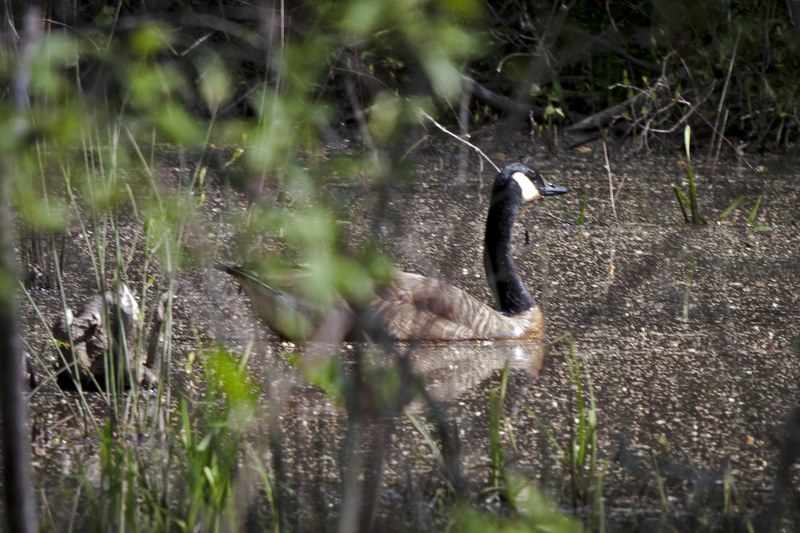 A family of Canada geese raucously argues over the best swimming spots, their calls echoing up the hill where I pull weeds in my vegetable garden. Mallards complain, quacking their disapproval, and until recently, female Wood ducks shrieked when suitors pressed a tad too ardently. I’m not hearing them anymore; I suspect they are sitting on nests. Every time I walk down for a closer look, I disturb at least one Great Blue Heron stalking the shallow edges of the pond. They rise, croaking in raspy voices that don’t match their elegant forms. Kingfishers patrol the creek, which has more — and larger — fish in it than we’ve seen in many years. 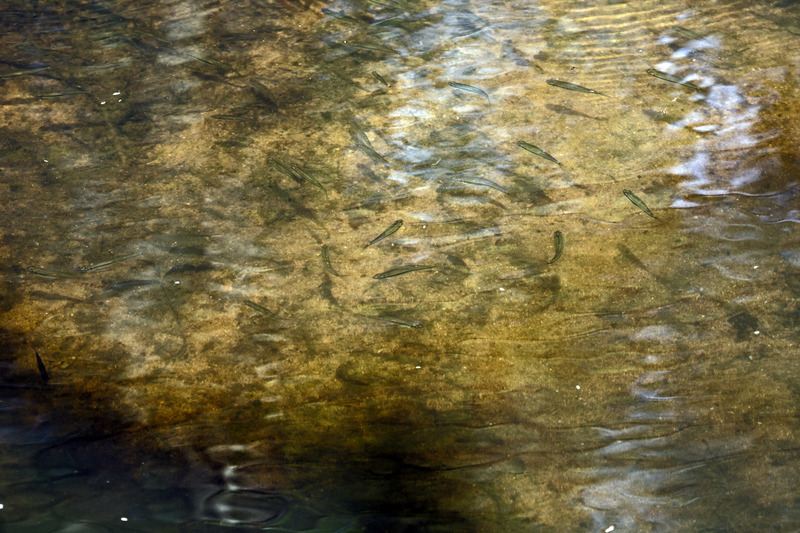 These are small fry, but Wonder Spouse is routinely spotting sizable brim and bass loitering in deeper spots in the creek. Dragonflies zip through the trees; frogs are less boisterous, likely because tadpoles teem in the shallows. Life abounds. And we get to live next door to it. 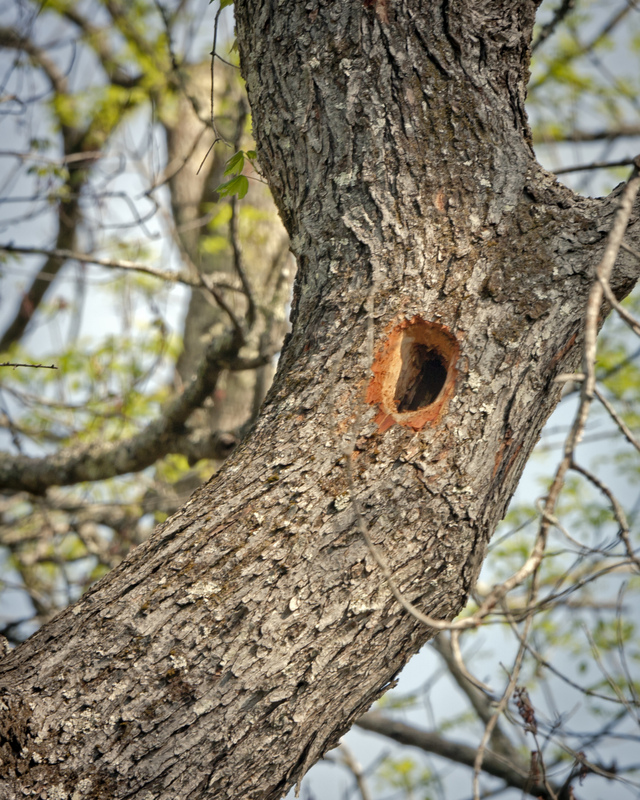 A freshly excavated woodpecker hole in a maple in the middle of the beaver pond. Recently, we showed a plant-loving friend our wetland treasure, knowing he would appreciate what some might perceive as a nuisance. His sharp eyes spotted caterpillars devouring willow leaves at the edge of the pond. 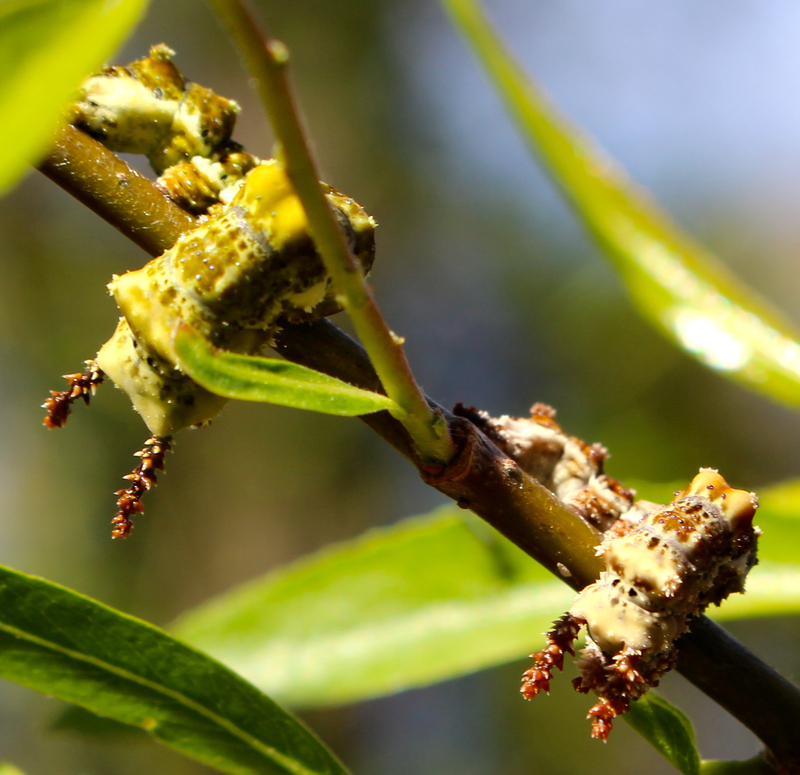 They turned out to be caterpillars of the Viceroy butterfly, a Monarch mimic that needs wetland food trees for its young. Caterpillars of the Viceroy butterfly appreciate our wetland habitat. This is my dream come true — living immersed in the natural world, where every day brings a new discovery, or the return of an old friend as another species pops up for the season. I feel deeply blessed to live in this place and this time while simultaneously worrying about how outnumbered my wild friends and I are these days. Just a quarter mile away as the crow flies, a massive subdivision covering a thousand acres is nearly complete. Whole neighborhoods are getting group rates from insecticide companies that spray “safe” poisons throughout their yards to kill ticks, mosquitoes, and spiders on contact. On contact? Safe? Can anyone hope to touch, much less open, the minds of those so profoundly disconnected from the natural world that they think a dead, sterile landscape is an ideal? All I know to do is to keep talking and writing about my green world, in the hopes that at least some of the plant blind — those who cannot distinguish, or can’t be bothered to distinguish, between a maple and a sweet gum, an ash and a walnut, a beneficial spider and a disease-carrying tick — will learn to see the beauty, wonder, and essential role of the natural world they so blithely ignore. I’ll leave you with two final photos of small jewels native to my wetland and currently blooming there. Many of the photos in this post were taken by the amazing Wonder Spouse and his long lens. A number of the close-up shots are mine. Now that the wetland trees and shrubs are almost fully leafed out, we won’t be able to get many more good shots of the beaver pond, so I hope you enjoy these. Maybe if every lover of the green world could crack open one plant-oblivious mind per month, maybe, just maybe, we could still salvage what is left. This entry was posted on April 18, 2017, 4:50 pm and is filed under Conservation Corner, Favorite Plants, Native Wildlife, piedmont gardening. You can follow any responses to this entry through RSS 2.0. You can skip to the end and leave a response. Pinging is currently not allowed.